How much water does the olive tree need ? When you want to take care of the olive tree the first thing that is important is the irrigation. The olive tree requires regular watering in dry weather. This is in addition to the sun the most important condition for a good growth. One must give the olive tree water regularly this is a must. We (the Bergerie) found out that the biggest mistake that people make is that they think the olive tree hardly needs any water. After all, they come from warm and dry areas where little water is present, so water is essential. This idea is understandable. Naturally rooted olive trees penetrate deep in the ground and therefore they can last longer without water. Olive trees that are planted in pots or just planted in the ground, have a compact root ball. It is necessary to ensure that the soil does not completely dry out. Occasional watering is required and needed also in the winter time. Caution, wet feet (the roots are in too wet ground) is not good for the olive tree. This is easily prevented by ensuring that the water can drain properly. For example, by drilling holes in the pot and sufficiently using shards or hydro grains on the bottom of the pot. Further, the ground must be properly water permeable. How much water do you have to give the olive tree in the winter? In winter rainwater is usually more than enough for the olive tree. If the soil is too wet then one can decide to place the tree in a sunny spot just under a canopy or the clod partially covered with a board. The moisture content of the root ball should be between 20 and 30 percent. What is the proper soil structure and fertilizer for the olive tree? The olive tree is in clayey soil, coming from the area of central Spain. The trees are already about five years earlier placed in the plastic pot and are therefore fully acclimatized. Due to a relatively small root system one can change (repot) the tree every 3 to 5 years depending on the density and the compactness of the roots. When you notice that the density is too high you have to repot the tree. Make sure that when you change the pot there is an opening in the bottom so the water can drain from the pot. When you repot the tree make sure that at least 3 to 4 inches space is between the clod and the new wall of the pot. Also add fertilizer tablets so that roots will get into the new spoil easier. How big should the pot be for the olive tree? At first one can choose for a matching pot. When the density becomes too high one can choose a new pot that is 3 to 4 inches wider, where the olive tree can still remain for about 3 to 5 years. The Bergerie has a collection of wooden containers. The Bergerie has special olive tree ground which approximates the conditions of the Spanish ground. In particular, the water balance is regulated by the addition of clay and peat. The Bergerie has years of experience in the care of olive trees. 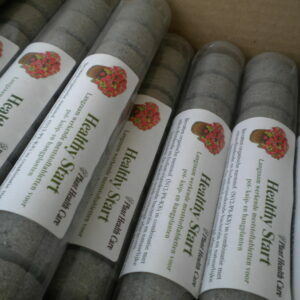 The olive substrate has a better draining effect. Through a coarse composition of clay, lava and coir fibre as a first bottom layer, the water absorption is excellent for the root system. This mixture dries quite quickly after a wet period. The clay ensures that water is retained and the soil will not easily dry out. How do I fertilize the olive tree? Fertilization is part of the care of the olive tree. When the Bergerie repots or plants the olive tree they always use a fertilizer package that holds Mycorrhiza. 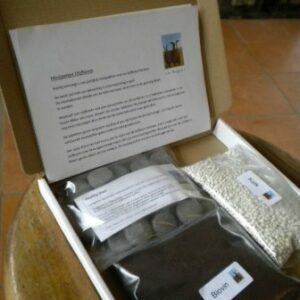 The Bergerie has composed a special fertilizer tablet and composed a special fertilizer package for olive trees. The tablets and the materials (soil improvement materials) inside the box are complementary to another. It improves the soil ecology and the soil system. Due to the fact it is a slow release tablet you only need to do it twice in a year (first in the spring time and just after the harsh winter period, the second one you can do in the late summer period September or August). If you want to give your tree something extra it is not harmful due to the fact that the materials in this box are organic materials. In addition to the Healthy Start fertilizer tablets we also sell lime and BioVin as a soil improvement material everything to give the best care for your olive tree. How do I prune the olive tree? You don’t only prune the olive tree for the form but it is also needed for the care of the olive tree. When twigs (long thin branches) grow too long the leaves at the beginning will fall off. Pruning can be done throughout the growing season, preferably in the spring or during the summer. Definitely not in the winter period. You can always cut the dead wood. Keep the centre of the crown lightly and remove vertical growing and crossing branches. Cut the small shoots down the trunk road. By buying the right fertilizer for your olive tree(s) you will notice that the olive tree will thrive.